Our orange ribbon necklace will provide hope and comfort in the fight for a cure for diseases such as MS, leukemia, and skin cancer, all of which are causes represented by an orange ribbon. Family and friends who are fighting one of these diseases will want to wear this necklace showing that they, too, have hope that one day a cure will be found. The Pendant is a silver-plated circle frame that features a 1” diameter crystal insert. It is printed with our MS Awareness Ribbon design. The awareness pendent hangs from a silver-plated Ball Chain Necklace, measuring 23” long. 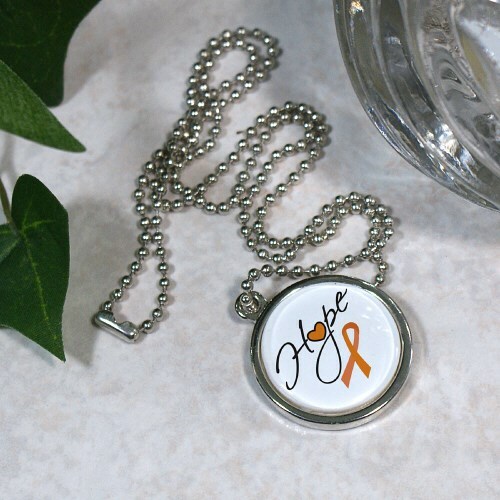 Great Multiple Sclerosis Jewelry for fund-raisers or awareness walks. Additional Info People who are battling difficult diseases like MS, Leukemia, and Skin Cancer will need hope and strength to fight through. This beautiful hope awareness necklace will be an accessory they can wear whenever they need that extra boost of strength. Please also see our Orange Awareness Pin, which will let others know how passionate they are in the fight for a cure.